This virtual command center allows hospital personnel to train in the Hospital Incident Command System. When staff at a hospital in Bethesda, Maryland, recently practiced disaster preparedness, they sat down at a computer and entered a virtual world, a world of 3-d characters and interactive role playing developed by the National Library of Medicine (NLM). “The goal of virtual training is to get hospital personnel to react the same in real emergencies as they do in virtual ones,” says Victor Cid, senior computer scientist for NLM’s Disaster Information Management Research Center. The virtual world was created as a research project for the Bethesda Hospitals’ Emergency Preparedness Partnership (BHEPP), a collaborative effort between the NLM and three nearby hospitals. Once almost the exclusive domain of video gamers, virtual training is now a crucial component in many professions. BHEPP is studying its potential for training hospital staff in disaster preparedness and response. Cid leads the “Virtual Hospital Incident Command System Training” research project. He designed a virtual command center so hospital personnel can train in the Hospital Incident Command System (HICS). HICS is a nationally-recognized model that hospitals use to manage emergencies and other events—by defining roles and responsibilities, procedures and communications. An initial test of the virtual world was done last summer with one of the BHEPP partners, Suburban Hospital Johns Hopkins Medicine, and documented in a video. In the video, Cindy Notobartolo, Corporate Director Emergency/Trauma, Safety & Security Services for the hospital, describes how training leaders to “become avatars and play different roles in incident command” allows them to learn how the system really works. Earlier this year, the team returned to Suburban for a two-day multimedia training exercise using the virtual command center Cid developed. The team simulated realistic disaster management situations. 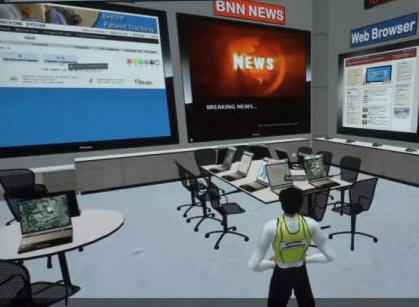 Participants created computer avatars (personalized graphic images) and practiced roles such as incident commander, public information officer, logistics chief, and planning chief. Just as they would in an actual command center, participants communicated back and forth, used interactive maps and news bulletins, organized meetings, and even shared computer displays. One of the more involved scenarios was a hurricane disaster, inspired by evacuations caused by Hurricane Sandy, in which the Suburban Hospital HICS staff practiced a total hospital evacuation—for the first time. A total evacuation is an extremely complicated, far reaching operation with multiple areas to consider including patient safety, costs and logistics. The research team developed multiple variables and several evacuation plans. The effort, they said, was a success. Virtual training demands as much preparation as traditional table top exercises, and requires training on virtual tools. The beauty of the virtual world is its 24/7 availability, explains Cid. Participants can schedule trainings around their everyday work assignments. And training instructors give them real-time feedback about their decisions and actions during an exercise. Actions are logged and reviewed by instructors for a detailed, after-action report to the hospital. The online site Second Life hosted the NLM virtual world. NLM contracted with Aquilent, Inc. and the Center for Health and Homeland Security at the University of Maryland to help design and run the online disaster training exercises. Colleagues from the Federal Emergency Management Agency and the National Center of Disaster Medicine and Public Health were invited to watch the January training exercise. Cid said they expressed interest in the technology, while the training participants said they were pleased with the experience and can envision this virtual training becoming a regular addition to the training courses in the Hospital Incident Command System. NLM is now enhancing the virtual training platform and working with all the hospitals in the BHEPP to help plan and conduct their own training events. June 14, 2013 in Products.